Not a cloud could be seen in the azure sky as the morning sun enveloped Shangri-La, a mysterious, scenic destination in the Deqen Tibetan Autonomous Prefecture in southwestern China’s Yunnan Province. A singular fragrance lingered in the air around Songtsam Shangri-La Lodge, a boutique hotel nestling between Ganden Sumtseling Monastery and Kena Village. The breeze bouncing off the nearby mountains generated a sound like whispering bamboo flutes. Withered leaves fell from several white birches and smoke trees in the corner of the hotel’s courtyard, glowing like rusted gold in the sun, while a four-story Tibetan-style building completed the tranquil picture. 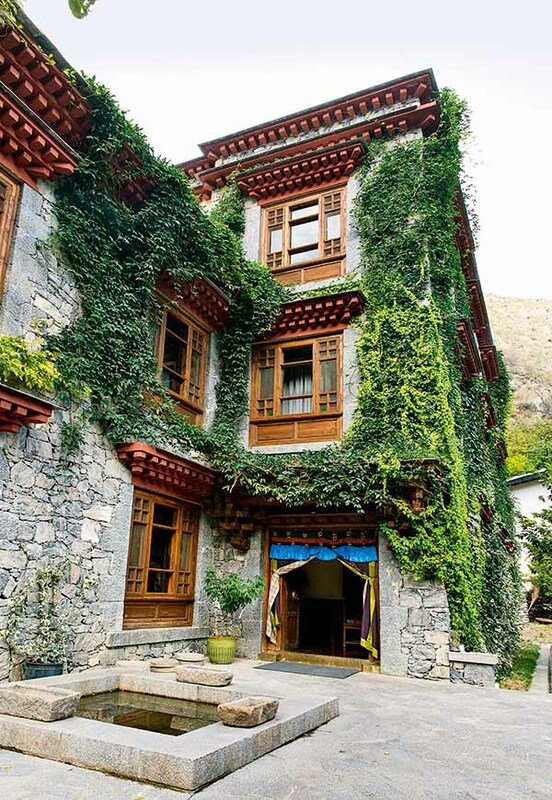 That dwelling was Baima Dorji’s childhood home, and it is now one of China’s most prestigious boutique hotels. Having returned from a business trip at midnight the previous night, Baima looked worn out. But the Tibetan’s voice remained as calm and gentle as a glassy pond without any ripples. I pondered whether such calmness derives from internal peace or his innate temperament. His hotel’s management team is diverse: some are local villagers, some foreign executives, and others seasoned hospitality professionals. Regardless of their backgrounds, they all see Baima as a teacher and kind uncle as much as a boss. Baima found his place in the hospitality industry relatively late in life. After graduating from high school, Baima studied animal husbandry in Kunming, capital of Yunnan Province. In 1992, China Central Television (CCTV) recruited Baima. 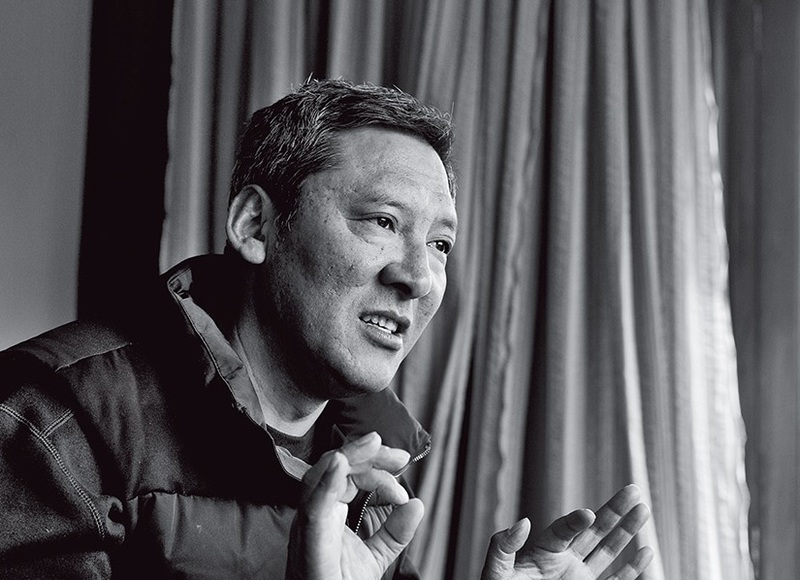 He developed the hope that television could serve as a bridge connecting Tibetan culture to others from beyond Tibetan-inhabited regions. “I wanted to help more people understand Tibetan culture because we are one big family,” he grins. After joining CCTV, Baima produced some documentaries on Tibetan culture, which earned great acclaim from critics. In 1998, his TV documentary, Portraits of Mountains, walked away with the Excellent Prize from MIPTV, an annual TV event in Cannes, France. During that era, Baima heard frequent complaints from his colleagues about the less-than-ideal accommodation in Deqen after they returned from business trips there, despite the region’s picturesque scenery. Baima remembered seeing many boutique hotels in Paris and once stayed in one near the Arc de Triomphe while on his way to attend MIPTV. That lodge in France inspired the idea of converting his home in Kena Village into a boutique hotel. His home featured two courtyards and buildings inhabited by his parents and sister’s family that covered more than 1,000 square meters. In 2001, Baima razed the old buildings in the two courtyards and built the 22-guestroom Songtsam Shangri-La Lodge in their place with 60,000 yuan (US$8,693) he had raised. The same year, his home county of Zhongdian was renamed Shangri-La County. Baima recruited the first manager of Songtsam Shangri-La Lodge from Kunming, where he was running a four-star hotel. Their different operational ideas meant the manager often conflicted with Baima, who wanted a tranquil hotel rich in cultural atmosphere rather than a bustling business. The hotel suffered heavy losses in its early days. Baima consecutively hired a German, an Austrian and a Xi’an native to manage the hotel, but none of them could turn things around. In those days, the hotel charged 80 yuan per night and 11 yuan per person for a lunch. In 2003, Baima began to manage the hotel himself. He even lived there to train employees as much as possible and urge them to slow down to match the development pace of the hotel. Eventually, Baima hired the hotel’s current manager, Zhang Min. Thanks to their joint efforts, the hotel finally found a path to sound development. They hired locals to introduce Tibetan religion, culture and history to guests. 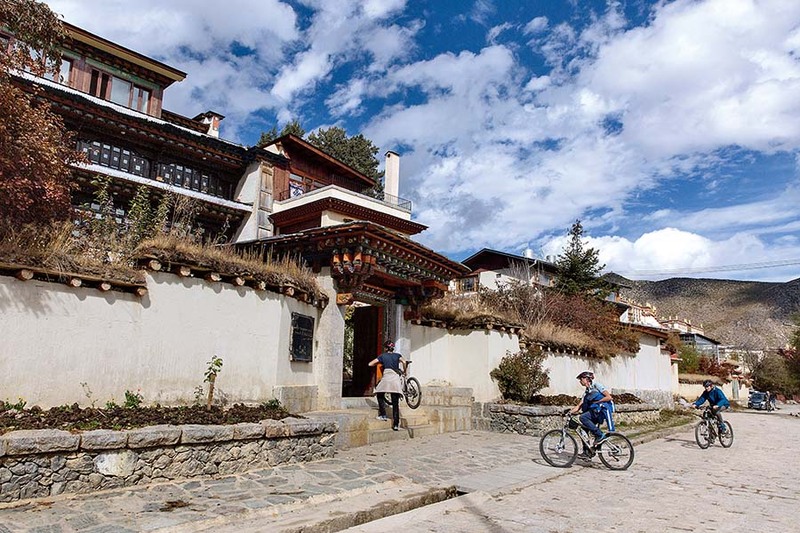 “I wanted every guest to feel the intimacy of Tibetan culture and enjoy a natural stay,” adds Baima. As time went on, Songtsam Shangri- La Lodge welcomed an increasingly heavy flow of guests, even as its rates went up. After spending one night in the hotel, many backpackers canceled other reservations to stay there for a full week. Gradually, the hotel became famous. Many investors tried to buy into it, but Baima refused. “I didn’t feel like the business was strong enough to absorb extra capital,” he explains. In his eyes, every move should be made in a prudent, reasonable manner, especially in terms of non-renewable resources. Deqen boasts unparalleled tourism resources. If properly utilized, they benefit everyone. In Baima’s opinion, it’s better to prevent outside capital from squandering those resources in a non-renewable manner until later generations can pinpoint the best way to capitalize on them sustainably. Since the day Songtsam Shangri-La Lodge was established, Baima has been clear about his goal of operating the hotel sustainably. To this end, he invested a decade of research and planning. He never rushed the hotel to market or expanded it. In 2009, Songtsam Linka Retreat, a towering hotel built from scratch, opened for business atop a hill facing the Ganden Sumtseling Monastery. In 2011, four more Songtsam hotels opened in Deqen, one after another. An hour’s drive from Shangri-La is Benzilan, a must-see stop along the ancient Tea-Horse Road on the banks of the Jinsha River. Songtsam Benzilan Lodge, situated in a small village of only a dozen households hidden in a valley, is only linked to the outside world by a cobblestone path. The windows of the hotel face the entrance of the valley, beneath which lies the farmland of local villagers. From Benzilan, one can reach Deqen County on the banks of the Lancang River on the other side of the Baima Mountains. Every year, numerous tourists visit Meili Snow Mountain. Baima is proud of the location of his Songtsam Meili Lodge. The mysterious, snowy mountain is visible from guestroom windows. Heading south along the Lancang River, one can reach Cizhong, where a French missionary built a Catholic church in the early 20th Century. Songtsam Cizhong Lodge lies just 200 meters from the church. Almost every local household owns a vineyard. Utilizing winemaking techniques inherited from the French missionary and high-quality grapes growing at altitudes of more than 3,000 meters, the local wine is famous for its unique taste. It takes four hours to drive from Cizhong to Tacheng, a place noted for the famous Bodhidharma Cave and Yunnan Golden Monkey National Park. There, Songtsam Tacheng Lodge nestles amidst villages, terraced fields, mountains and rivers. Today, Songtsam hotels form a loop, with Shangri-La at the center. Many tourists are awed by the strong Tibetan flavor of Songtsam hotels. In the four-story Songtsam Shangri-La Lodge, the strong aura of Tibetan culture is everywhere. Every thangka painting, carving or furniture item radiates Tibetan flavor. These thoughtful touches inject life and vigor into the hotel, and even make it less like a hotel. 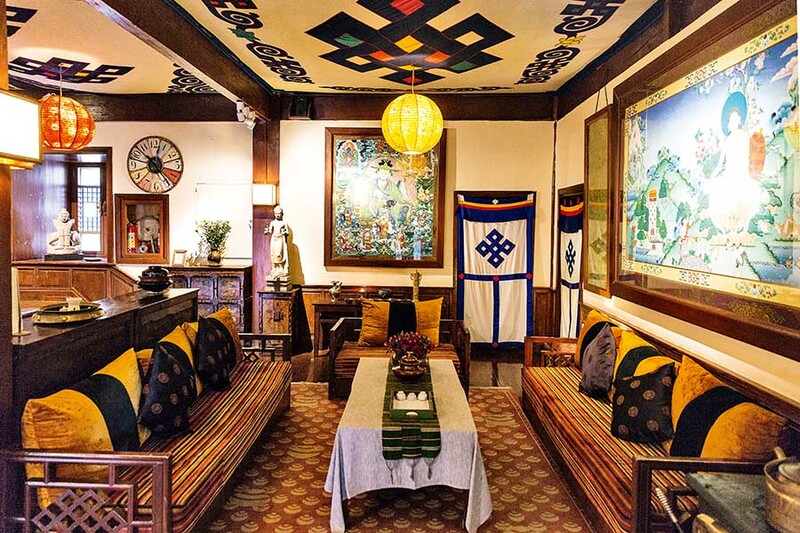 Many of the Tibetan furniture items and ornaments in the hotel came from Baima’s personal collection. Some have expressed concern about using such precious items to decorate the hotel’s lobby, restaurant and even guestrooms, where they could be damaged. Baima, however, considers his collection valuable only if it is displayed. “If such items are hidden from visitors too long, they get depressed,” he jokes. Songtsam hotels also cooperate with nearby craft workshops by referring their guests to visit those shops, to promote the development of local crafts. Baima is profoundly aware of the importance of education. Since 2005, he has been providing financial support to students in his home village. Wherever his hotels open, he introduces grants for local students to the tune of 500 yuan for each middle-school student, 1,000 yuan for each high-school student and 2,000 yuan for each college student. “Life is long, and doing good things makes the whole process more meaningful,” he asserts. Perhaps Baima’s mission to spread Tibetan culture has just begun.